We offer sizes from small to very large as well as custom sizes and frames. 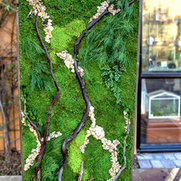 Installations of small to large naturally preserved or a mix of living/preserved green wall art, designed with real plants. Custom sizes and requests are welcome. Mrs. Cote designed a piece for my office. I own an environmental consulting firm so it was important to me to have something that reflected my love of nature. Artisan Moss was able to capture that in this piece. I receive compliments on the piece every time a client visits my office. It's so original and beautiful, it is a great ice breaker. I am very happy with my piece and I intend to expand my collection very soon! I have purchased several small Artisan Moss pieces from Erin for use in my office and gifts to friends and family. They are something really special and bring the beauty of the outdoors to the inside. There's an ease of maintenance because I don't have to water or find a place with direct sunlight! This is the best piece of mixed-use art I've ever seen. And every piece is originally made so no piece is a duplicate. Erin even took the time out to return my phone call about a special request for a friend of mine. She's awesome and the art is awesome too!